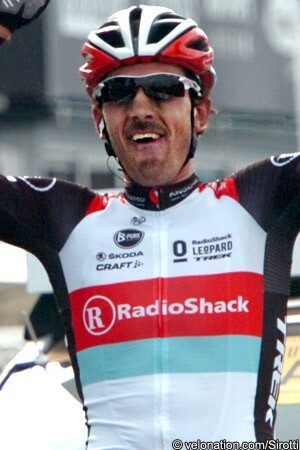 Fabian Cancellara (Radioshack-Leopard) overpowered all challengers to take his second victory in the Tour of Flanders, exploding the elite bunch on the final ascents of the Oude Kwaremont and the Paterberg and dropping his biggest challenger coming into the race, Peter Sagan (Cannondale). Cancellara rode to victory in what has become vintage Cancellara style, by blowing up the race on the final climb and then time trialing to the finish at speeds that no one can match. Sagan would come home second, ahead of Jurgen Roelandts (Lotto-Belisol) in third. The Swiss rider patiently waited until the third of three times up the Oude Kwaremont before emerging for the first time, with just under 20 kilometres to race. The approximately 30-man peloton was instantly in tatters, and only Sagan was able to hold Cancellara’s wheel, though even the Slovak sensation appeared to be suffering badly. The duo joined up with Roelandts, who had attacked previously to join an earlier breakaway group. They hit the Paterberg for the final time as a trio, and though Sagan was able to hold on up the steepest pitches of the storied climb, it was just too long for him. The 23-year old cracked just meters from the top, but Cancellara was obviously the stronger man. In the blink of an eye, he had ten seconds, and then 15, and then 20. Roelandts was dropped first on the Paterberg, and soon the Belgian had come back up to Sagan, but the duo’s chase was fruitless. Cancellara had more than a minute on them when the time came to celebrate the finish. Sagan and Roelandts worked together to hold off a group led by Sylvain Chavanel’s Omega Pharma-Quick Step team, and then sprinted for second. Roelandts conceded to Sagan, who pumped his fist over the line – a well-earned podium finish for both. “The goal was to win, and sometimes you can’t predict how it will come,” an initially speechless Cancellara sighed at the finish. “It’s just amazing. One year ago I was on the ground, but now I’m back and I won Flanders on the new course. Winning as a big favourite is not easy, so I’m just happy. I was a strange race. It was fast in the beginning, and we had to work hard and take over early. But that was the key, because there weren’t many riders left at the end. Chilly temperatures and dry roads, thankfully, greeted riders at the start in Brugge. Astana’s Jacopo Guarnieri was sick most of the night and did not start, and Eliot Lietaer (Topsport Vlaanderen-Baloise) was the first to crash out on the road. Notably, pre-race favourite Tom Boonen (Omega Pharma-Quick Step) was the second to crash out, suffering contusions to his hip and knee, although the Belgian did not have any fractures, and was able to gingerly make his own way into an ambulance after just 20 kilometres had elapsed. Alex Dowsett (Movistar), Andreas Klier (Garmin-Sharp) and Zak Demptser (NetApp-Endura) formed an early break that achieved 30 seconds, but they and any others who tried were hauled back in a swiftly-moving first 90 minutes of racing. Everyone was still together after more than 75km were covered, and it took the first climb of the day, the Tiegemberg, to finally force a breakaway clear. Jetse Bol (Blanco), Jacob Rathe (Garmin-Sharp), Michael Mørkøv (Saxo-Tinkoff), Tosh van der Sande (Lotto-Belisol), Tim De Troyer (Accent Jobs-Wanty), Kevin Claeys (Crelon-Euphony), and Laurens de Vreese (Topsport Vlaanderen) were quickly given a three-minute lead as the peloton eased up. But it wasn’t long before Europcar hit the front of the peloton for the first of several extended turns, whittling 45 seconds off the break’s advantage in just a few kilometres. The French team pushed the pace into the Taaienberg, bringing the breakaway advantage down even further, to 2’50” and still dropping as the Eikenberg came soon after. With 130km to race, Europcar was back on the front and pushing again, bringing the seven leaders back to two minutes, a lead that dropped to 1’05” just five kilometres later. Over the Molenberg, de Vreese showed himself as the strongest man in the breakaway group, and pushed the pace over the climb. But the peloton steamed into the Molenberg as well, now within 40 seconds of the seven leaders. Sensing a new opportunity, André Greipel (Lotto-Belisol) got another round of attacking underway, moving out of the peloton on the Molenberg and keeping the pace high over the top. Knowing the quality of the attacker, several riders sped up hoping to bridge, which several did. Yoann Gene and Vincent Jerome (Europcar) joined Greipel, along with Martin Tjallingii (Blanco) and Michal Kwiatkowski (Omega Pharma-Quick Step). This group closed down on the original breakaway in only minutes, forming a new leading group of 12, with the peloton a minute behind. Although Gene suffered some kind of malfunction and was soon back in the main bunch, leaving 11 up front. Radioshack-Leopard began several long turns of work with still more than 100 kilometres to the finish, and they helped bring the Griepel group back to within a handful of seconds. Importantly though, the peloton did not bring them all the way back, instead pulling the breakaway just close enough to inspire Marcel Sieberg (Lotto-Belisol) to join team-mates Greipel and van der Sande in the break. Over the Berendries climb and sensing a slackening in the pace, Greipel pushed on and was joined by five others, while six of the original breakaway members, including Mørkøv and Rathe, were pulled back into the peloton. This left the Lotto-Belisol duo of Sieberg and Greipel, along with Bol, de Vreese, Kwiatkowski, and Tjallingii up front, and the six men went back to work, while the peloton was content to let them. They had more than 30 seconds in hand over the top of the Valkenberg, and a trio of Jose Joaquin Rojas (Movistar), Anders Lund (Saxo-Tinkoff), and Stuart O’Grady (Orica-GreenEdge) were inspired to try and join them. This trio spent much of the next ten kilometres in no-man’s land, before eventually rejoining the peloton. At the back of the main bunch, a crash involving Gabriel Rasch (Sky Procycling), Sep Vanmarke (Blanco), and Jerome Cousin (Europcar) briefly shook up all three riders. With 90km to race, the Greipel escape was out to 1’15”. Cannondale joined Radioshack-Leopard at the front, doing what would turn out to be important work. With Europcar back on the front of the main bunch, Sagan was getting paced back to the front by two team-mates after time spent in the team cars. With 80km to go, approaching the first of three times up the Oude Kwaremont, the O’Grady group was back in the bunch and Yoann Offredo (FDJ) pushed ahead for the first time. The gap to the main breakaway was back down to 30 seconds, and Bol was the first man dropped out of the escape over the top of the climb. Offredo decided it would be best to wait, and with now five men left up front, status quo was maintained into the Paterberg for the first time. Garmin-Sharp led into the climb with Jack Bauer and Johan Van Summeren, but it was too early for moves to be made, and the Koppenberg loomed large on the horizon. Ag2R-La Mondiale and BMC Racing found comfortable places at the front of the cobbled, 20% pitches, but a Vacansoleil-DCM rider lost traction behind, and brought the second half of the peloton to a standstill. Many riders caught behind were forced into the legendary Koppenberg run-up, and while some riders would never catch back on, a feed zone over the top eventually allowed some to reattach. The gap to the break was back up over a minute as the peloton took on energy, but Mirko Selvaggi (Vacansoleil-DCM) and Sebastian Minard (Ag2R-La Mondiale) used the opportunity to escape. Behind, Cancellara’s name was mentioned for the first time, as a rear flat forced him to the side of the road. But a quick change by his mechanic allowed him back into the main bunch just before the Steenbeekdries climb. Ahead, Selvaggi and Minard did good work to quickly reel in the escape of five, making it a group of seven with a minute’s advantage and 50km left to race. Ten kilometres later, the peloton was speeding into the Oude Kwaremont for a second time, bringing the gap to the seven escapees down under 30 seconds again. Selvaggi led the breakaway up the climb as Sieberg and de Vreese were dropped, and BMC took control in the peloton. Tjallingii and Minard were also dropped out of the break, but the peloton took it easy up the Kwaremont again, leaving the break dangling 45 seconds ahead. Geraint Thomas (Sky Procycling) crashed out of the peloton on the wide section of road descending the Kwaremont, but he would soon be back in the group, which had yet to light the fire. Moving into the Paterberg for a second time, Tjallingii and Minard were forced back from the breakaway a second time, and Greipel was dropped this time as well, as Kwiatkowski and Selvaggi went forward. In the main bunch, Roelandts made his decisive move on the Paterberg, pulling with him Offredo, Sebastian Hinault (IAM Cycling), and Sebastian Turgot (Europcar). This quartet soon caught the waning Tjallingii, who was able to hang on as he worked the Paterberg out of his legs. These five men soon moved up to Kwiatkowski and Selvaggi, forming a newly renovated group of seven at the front. There was now less than 30 kilometres to race, and the peloton was just 30 seconds behind. As the kilometres added up, Tjallingii was the first to succumb out of the breakaway, rejoining the peloton just as Juan Antonio Flecha (Vacansoleil-DCM) came back from a mechanical that had put him behind. Rounding back to the Oude Kwaremont for a decisive third and final time, Roelandts was driving his breakaway as Omega Pharma-Quick Step and Vacansoleil-DCM took control behind. On the climb, Roelandts pulled Hinault clear of Offredo, Turgot, and Selvaggi. The Lotto-Belisol rider soon dropped Hinault and moved forward solo, leading the Tour of Flanders by himself with under 20km to race. As the worn out peloton hit the Kwaremont, with many riders thinking about burning their final match, Cancellara set his whole matchbook on fire. The Swiss rider came to the fore with Sagan and Edvald Boasson Hagen (Sky Procycling) glued to his wheel, and Chavanel was struggling to hang on. Cancellara kept the pressure on and even Sagan was forced to dig deep. The Slovak was quickly the only rider left stuck to Cancellara, while Offredo, Turgot, and Selvaggi were merely roadblocks to skirt around in the duo’s trek up the Kwaremont. Cancellara powered past each dropped breakaway rider and Sagan struggled to hang on. Kwiatkowski briefly attached before being dropped by another dig by Cancellara. The Swiss rider and Sagan crested the Kwaremont alone, and they quickly had Roelandts in their sights. With still 16km and the Paterberg to race, Roelandts knew it would be useless to try and hold off the Swiss and Slovak express, so he sat up to wait. Kwiatkowski waited for a group of 20 riders which had consolidated behind, deciding to use the last of his energy to support Chavanel. As the leading trio turned right onto the Paterberg, and the final climb of the day, Cancellara pulled another torch out of his pocket. The peloton, led by Sebastian Langeveld (Orica-GreenEdge) and Luca Paolini (Katusha), were not far behind, but they wouldn’t touch the leading trio again. Roelandts was dropped first on the Paterberg, and then Cancellara finally shook off Sagan near the top of the climb. The Radioshack-Leopard rider had ten seconds of advantage in an instant, and Sagan signaled his doom by reaching back for an energy gel as Cancellara began to disappear into the horizon. With 10km to race, Cancellara had 30 seconds, the multiple world time trial champion firmly in the drops and riding away. Roelandts came back to Sagan and the two worked to keep Chavanel’s group behind. Cancellara blazed to Flanders victory number two, and Sagan jumped away from Roelandts for second. Both could only acknowledge with a smile and champagne toast, later on the podium, that each had been beaten by the obvious winner.